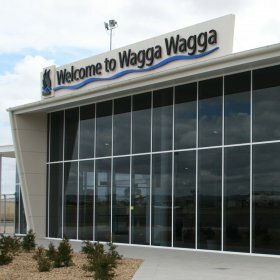 Rehbein Airport Consulting was commissioned by Wagga Wagga City Council to prepare a Master Plan for Wagga Wagga Airport. The Master Plan was required to take forward the growth of the airport, to realise its full potential as a major airline infrastructure and commercial hub and as a key focus of Wagga Wagga’s growing economy. Accordingly, consideration of developing the area surrounding the civil airport was fundamental to the plan. Econometric modelling was undertaken to develop forecasts of future passenger traffic under a range of economic growth scenarios. Various combinations of operating aircraft types and frequencies were then considered to determine future facility requirements. Possible non-passenger aircraft movements, such as those from commercial pilot training activity were also developed and runway options to accommodate this level of activity assessed. REHBEIN Airport Consulting prepared a series of staged development plans for runway, taxiway and apron infrastructure to accommodate up to 300,000 aircraft movements per year. Landside surface access requirements were also considered and an overall land use plan developed realising around 300 hectares of surrounding commercial development potential for a mixture of aviation and non-aviation related use.